What began as a Category 4 Hurricane has now weakened to a tropical depression, and the region that was pounded with heavy rain for six straight days is finally beginning to survey the damage that some experts say will cost more than Katrina and Sandy combined to repair. The remnants of the hurricane, which has killed at least 38 people, began traveling up the Mississippi Delta this morning. Although it appears the worst is over for Texas, many areas remain underwater and tens of thousands of people are still seeking refuge in overflowing shelters. Two explosions were reported at the Arkema chemical plant in Crosby, Texas, this morning, about 25 miles northeast of Houston. The explosion sent at least 15 officers to the hospital, and residents within a 1.5-mile radius were asked to evacuate. The owner of the plant later said he "fully expects" more chemical fires to occur. 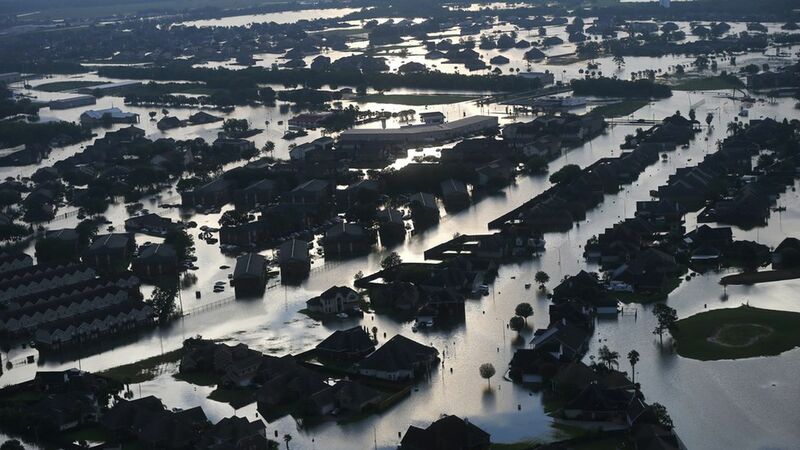 Officials in Beaumont, Texas issued a statement Thursday saying that the city had lost its main and secondary water supply as a result of the extreme flooding. Baptist Beaumont Hospital was forced to evacuate due to the lack of water. Press Secretary Sarah Sanders said that the president and first lady will travel to Texas and Louisiana Saturday, and will likely visit the Houston area and Lake Charles. FEMA reported that 95,745 people in Texas have applied for emergency assistance, which includes financial help with repairs and lost property. So far FEMA has disbursed about $57 million to citizens in Texas. Acting DHS Secretary Tom Bossert estimates that 100k houses have been affected by Harvey. Sanders said Thursday that Trump will pledge $1 million of "personal money" to Hurricane Harvey relief. The U.S. has deployed more than 6,000 active-duty troops to respond to Harvey, and an additional 1,100 are prepared to join them, according to the defense department. Pence holds prayer service for victims in Texas.